I put Buildyoursite.com through the paces for you. There is no software to install and no contracts to sign, which means that there is nothing to keep you from getting started. With thousands of templates and a library of Web applications, you have the ability to make your Web page stand out from the crowd. Customers applaud the live U.S.-based customer service in nearly every Build Your Site review. The support team not only helps you after the sale, they can assist you in logo creation and image design. Buildyoursite.com is a highly intuitive, easy-to-use Web builder, making it a fantastic starter site for small business owners looking to promote their product or services. Even the least tech savvy user can navigate the site and create a great looking webpage. With thousands of customizable templates to choose from, they even help you be more creative than you may have thought possible. From auto mechanics and artists to entertainers and entrepreneurs, Build Your Site will help you grow your small business. With Build Your Site, you don’t have to settle for cookie-cutter templates that make your site look like everyone else’s. You have access to over 4,000 designs from which to choose so that your Web page will stand out from your competition. I was able to select from industry-based themes like real estate, technology, and wellness. After that, I used their filters to narrow by design and color. What’s more, all of the templates are customizable, too. You are not locked in to a static form. You can easily edit, move, and delete every section on every page. They even offer free design assistance. One of the things that you’ll see in many Buildyoursite.com reviews is how much people love its ease of use. The site builder software is very intuitive. With easy to follow steps, you can get your website up and running in no time. The customizable templates are a breeze to filter through, making it a snap to find the perfect look. Once you have the template loaded, you can easily enter your content—text, images, music, video, what have you. Each page has multiple sections and subsections that can be interchanged to suit your needs. The Control Panel gives you access to tools that let you add application widgets, change templates, integrate social media, and incorporate SEO keywords—all with just a few clicks of the mouse. As with the rest of the Build Your Site builder, the pricing is very straightforward. There are no hidden charges. This is a pay-as-you-go service with no contracts. You are not tied into a particular plan. If your needs change, you can change plans. 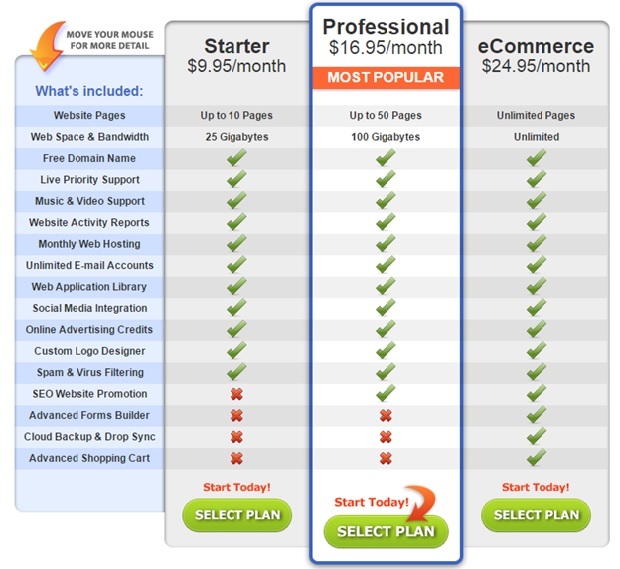 Plans start at $9.99 a month for the Starter package and cap out at $24.95 a month for the ecommerce plan. In my tests, I was not able to find a mobile-only version of the demo pages I created. The custom templates are highly responsive on the Web, though. The pages look great on every device I used to test them. Computers, tablets, and smartphones all reflect well-built sites. However, smaller versions of Web pages can sometimes be difficult to navigate on a hand-held device. Perhaps future versions of the Buildyoursite.com service will include better mobile capabilities. These ecommerce features give your small business the same tools that larger business have, eliminating their technological advantage and leveling the playing field. Most of the customer reviews that you find for this builder are quite favorable. They do what they do quite well. However, there are some areas where they do fall short. Here are some pros and cons I’d recommend you consider when deciding if this is the best Web builder for you. Ease of Use. There are no special skills required to get you off and running thanks to their point-and-click intuitive software. Customer Service. Users rave about the live, friendly, English-speaking support staff. Pricing Plans. There are no contracts no hidden costs, from set up to hosting to tech support. Blog. There is a limited number of pages in the Starter plan. There is a blogging add-in that comes with the more expensive Business and eCommerce plans. Mobile. Without a mobile-specific option, the navigation on hand-held devices leaves a little to be desired. SEO Tools. SEO submission and promotion tools do not come with the Starter plan. For $9.95 a month, these should be included. Customer support is one area where Build Your Site truly shines. Trustpilot gives them a rating of 9.7 out of 10. Nearly every review lauds the free, USA-based service. BuildYourSite.com has a team of tech support associates available should you need guidance selecting the proper plan for your business, building your site, or simply answering questions and addressing concerns. The company prides themselves on keeping their customer support team in house. No worries about having to deal with outsourced customer service representatives. You might even get a response from the president and CEO! In addition to email, phone, and chat contact options, there are help ticket forms and video tutorials embedded in the company’s website. Buildyoursite.com does have some SEO tools. However, they are not included in every package. The Professional and ecommerce plans include SEO website promotion so that you can better enhance your page for search engine results. In the Control Panel, you will find this important feature under Page Options. You find the effective keywords and Buildyoursite.com will submit them to over 172 search engines, including Google, Bing, and Yahoo. You are even able to include a meta description for your page. It must be noted, though, that the Starter package does not include the valuable SEO promotion resource. When it comes to hosting options, I found that this builder takes all of the guesswork out of the equation by including the hosting service in your monthly fee. You can take advantage of 99.99% uptime (verified by my testing) to make sure that your website is up 24/7. The temperature-controlled data center that is used for hosting has secured access entry, Dell stack servers featuring EqualLogic storage, a diverse routing network, and uninterruptable power. In short, you don’t have to pay extra for state-of-the-art hosting. One of the great features included with every plan is unlimited email addresses for your business. Your Build Your Site login gives you access to all of your company’s emails. I just set up a handful, but you can create accounts for every member or department of your company. In other words, the BuildYourSite.com login lets you create all of the email accounts that you and your online project demand. You’ll look more professional, too, with an email specific to your business (you@yourbusiness.com). For the most part, industry reviews have been fair and consistent. Universally, the ease of use and customer support stand out as key benefits of the service. 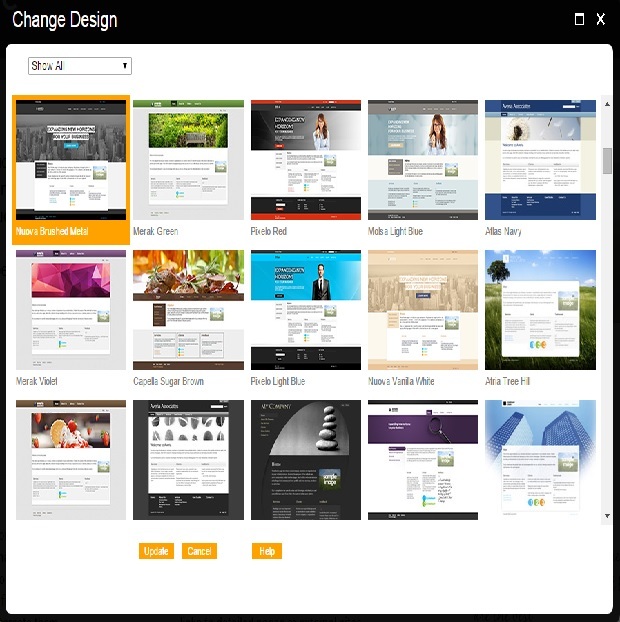 Another prominent feature from the reviews is the assortment of customizable templates. Oftentimes, templates can give a cookie-cutter feel. Not one review mentioned anything about BuildYourSite.com’s templates resembling other Web builders’ looks and feels. Many reviews commented on the company’s high Trustpilot rating as well as satisfied user testimonials. You get a legitimate chance to kick the tires with BuildYourSite.com. 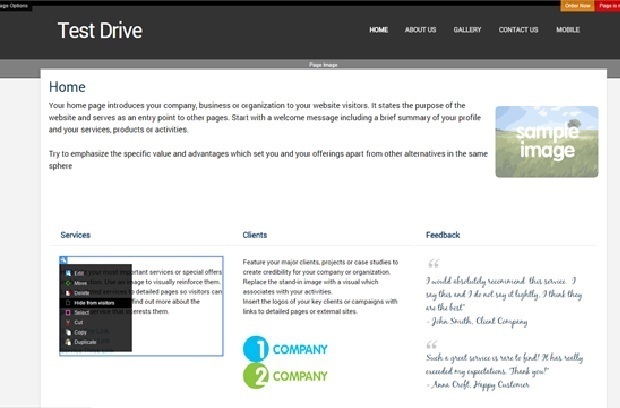 They offer a Free Test Drive live demo which gives you full access to their website builder. 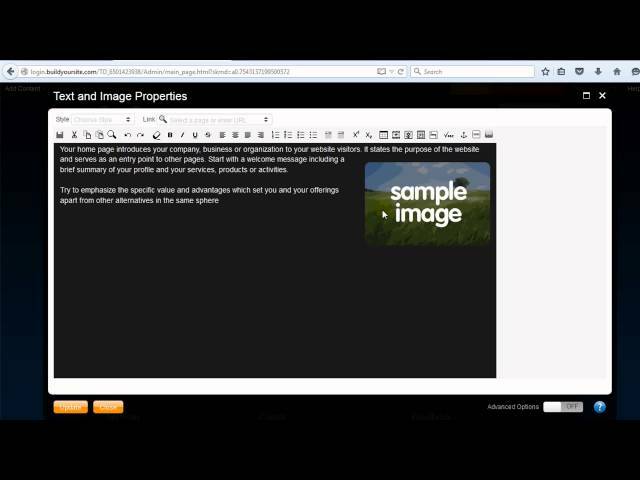 You can select templates, customize them, add content, and edit everything. With the test drive, you have the power to build your site for free with all of the features included in the ecommerce plan. From simply getting the feel for how to bring your vision to the Web to how to utilize the SEO feature so that you can promote your business, the Free Test Drive is a handy tool to see if this builder will work for you. Based on industry feedback, user reviews, and my testing, BuildYourSite.com is an excellent choice for an entry-level Web builder. With very little technical knowledge, creative abilities, or developer administrative experience, you can build professional-looking custom websites that will support anything from a simple online project to a large ecommerce undertaking. The live support, no-contract commitment, and all-inclusive pricing are bonus features. Even without them, this builder is an attractive option for small-business owners in any industry.